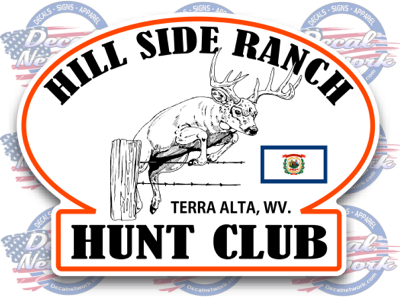 HomeOutdoorsHunt Club DecalsFull color sportsman club decalsOval custom full color hunt club decals 4" 5" 6"
Oval custom full color hunt club decals 4" 5" 6"
Before ordering make sure to read complete details about this decal and the ordering process. Minimum quantity for "Oval custom full color hunt club decals 4" 5" 6"" is 6. 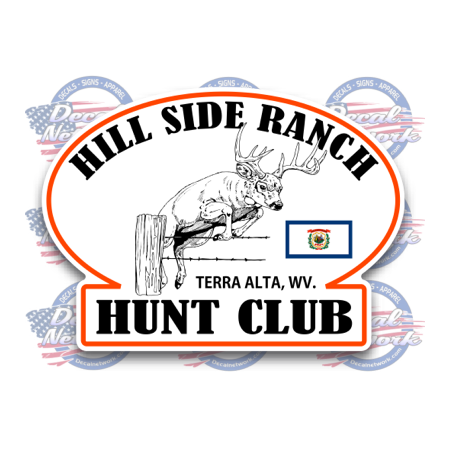 Custom Oval Full Color hunting - Outdoors - sportsman club decals. This decal is printed on high quality automotive / marine grade vinyl. Using UV inks and laminated with a clear glossy finish. Long lasting on outdoor applications. Can be use indoor or apply to any clean smooth surface. To see a sample of how your decal will look. Please send an email request to rick@decalnetwork.com . In your email add details of what text you want. CLUB NAME / TOWN - CITY - STATE / Est. date / Member / Season dates etc. Include what type of game animal or animals, Birds, Small game, fish etc. Last if you have a orefered color choice. We will setup a sample based on your request an email it to you. After veiwing you can reqest changes if needed. How to order: Once you agree on the final sample, you can place the order above by selecting the size. Than enter the decal description "Like text on decal. club name" this will indentify your design. Than enetr your Qty. there is a 6 decal minimum order. If you register for our website you can earn points for your orders. When you come back later or next year, you can use your points for deeper discounts.